Fishing requires plenty of time and patience; but imagine even after investing lots of your time and expertise in fishing, using the best fishing rod and baits, if you fail to be successful, how would you feel? To avoid such kind of embarrassing and un-delightful experience, it’s high time that you buy a portable fish finder to enjoy your fishing trip to the fullest. 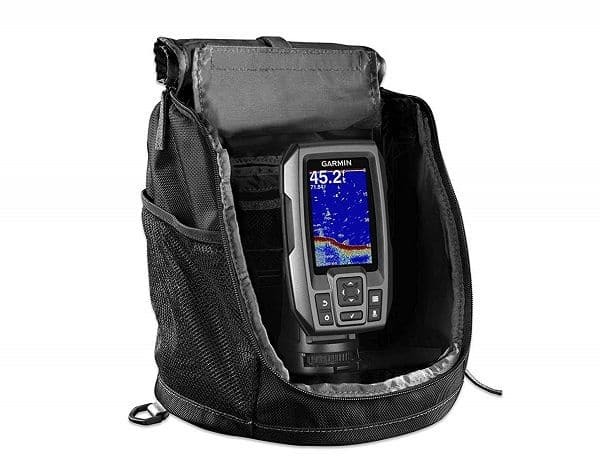 Among several different fish finders available in the market, we have selected a few of the most popular and top rated ones and conducted this portable fish finder reviews to help you with your ultimate choice and make your buying process a bit easier. How to read portable fish finder? How does a portable fish finder work? 2 x 2 x 1"
4.9 x 3 x 1.2"
9.6 x 2.2 x 5.9"
5.31 x 2.76 x 1.1"
One of the newest models of Garmin is its Striker 4 fish finder, and it was introduced with the intention of making ice fishing more effortless and convenient. It served its purpose right and went on to become one of the best portable ice fishing fish finders available in the market. This performance-packed fish finder comes with a high sensitivity built-in GPS system instead of a traditional navigational chart to ensure quick and precise location detection as well as delivers detailed representations of objects, structure, and fish under the water. One great feature that made this portable fish finder an instant fan favorite is its ease of use; it is super easy to install and incredibly easy to use. It has a keyed interface with dedicated buttons which can be operated easily in any fishing conditions. It has high-frequency sonar delivers near-photographic underwater images. It comes with a built-in flasher for added convenience. The upgraded version of the Humminbird’s original HELIX 5 G1, the G2 comes with several latest technologies and impressive new features that you have been missing in the original one. This fishing gadget has made its way to several portable fish finder reviews because of its incredible features and over the top performances. Unlike many of its competitors, the G2 Fish finder comes with a large 5 inches WVGA display that delivers super impressive color accuracy and incredibly clear pictures. This ultra HD display is equipped with a LED-backlit and has pixels of 800 by 480 for the clearest of pictures, even in the dark. Furthermore, as the name suggests, the G2 comes with a CHIRP Dual Beam sonar system that not only helps the fisherman with better underwater clarity but also makes sure that you can separate between the fish and water structures without any hurdles. It is incorporating a micro SD card slot for saving important points and large WVGA display with backlight for better navigation. If you are wondering where to find deeper fish finders, then you have come to the right place; the Deeper PRO PLUS Smart Sonar is one of those special fish finders for ice fishing and open water fishing, as well as perfect for many other types of fishing in both saltwater and fresh water. 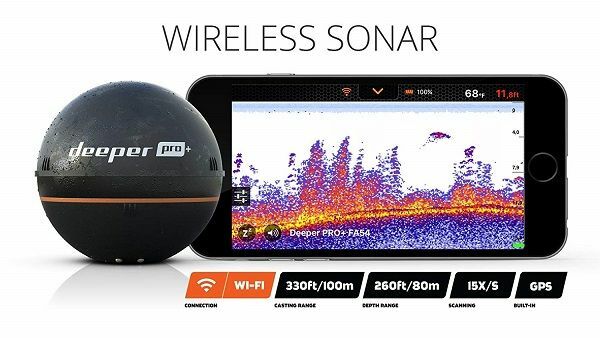 But its all-around fishing capabilities is not the only reason for this smart sonar to make its way into all the Deeper fish finder reviews, it has many more impressive features to excite its users. This PRO PLUS Smart Sonar has wireless Wi-Fi connectivity with an impressive range of 260ft so that you can enjoy uninterrupted services even from a far distance. Impressive wireless Wi-Fi connectivity for Un-interrupted service. The GPS enabled mapping feature ensure accurate location tracking. Moreover, the smart sonar with the GPS provides one of the best mapping systems to track fish according to your choice. The ReelSonar iBobber is extremely lightweight and compact in size that it can be fitted into your pocket effortlessly. But don’t get fooled by its size; this fish finder provides accurate sonar readings, even from a depth of 135 feet without any interruption. It has made its way into many portable fish finder review articles because of its incredible features and its immense popularity. 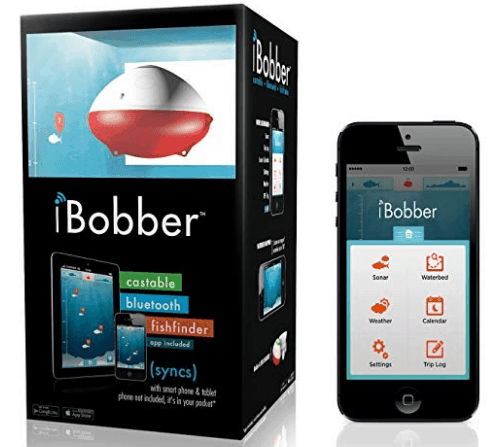 The best feature of this iBobber is that it maps the waterbed and tracks fish effectively using a patented sonar fish identifier technology and spot tagging GPS interactive mapping system so that you can enjoy a successful fishing trip in any weather conditions. 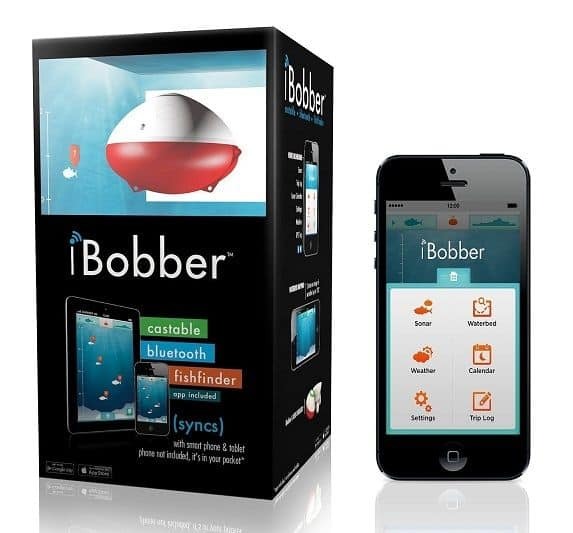 Incorporates a patented sonar fish identifier technology. It provides accurate readings of depths, structures, and fish gatherings. 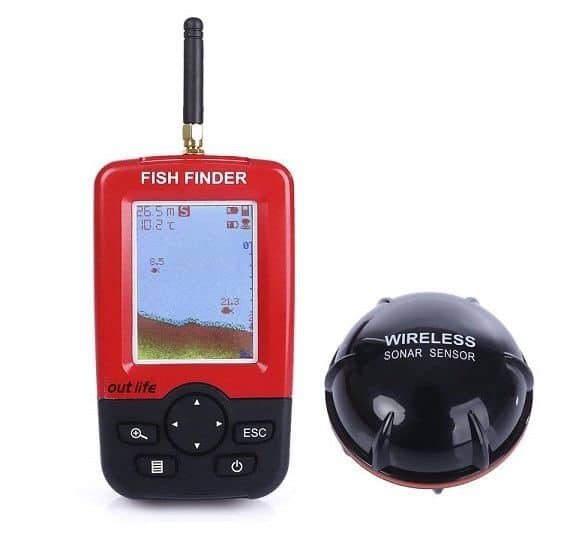 This fish finder also incorporates a Wireless Bluetooth system to connect your iOS and Android devices so that you can not only see underwater scenario but can also log several fishing data and conditions for future convenience, It includes social media sharing features for better convenience. 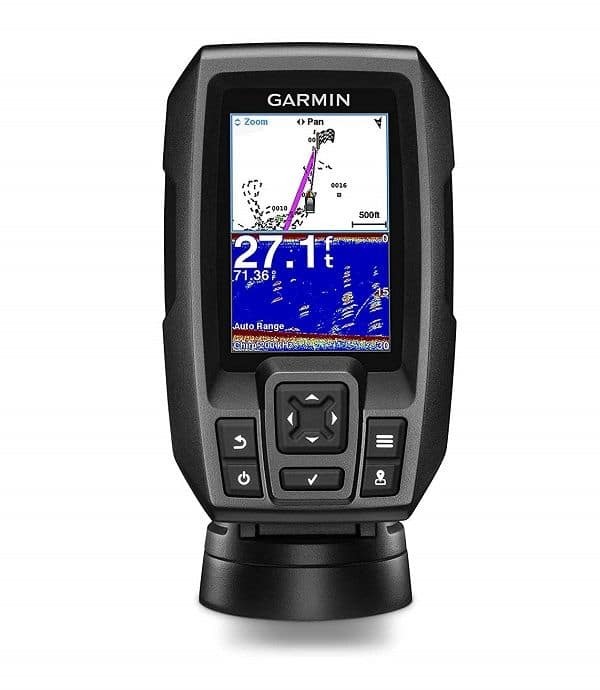 The Striker 4 fish finder from Garmin is loved by many fishing enthusiasts because of its power-packed performances and its super affordable price tag. The amazing features it includes are far better than many of its competitors and makes fishing in both saltwater and freshwater a fruitful experience, Moreover, it has includes a GPS Waypoint map for effortless location navigation. 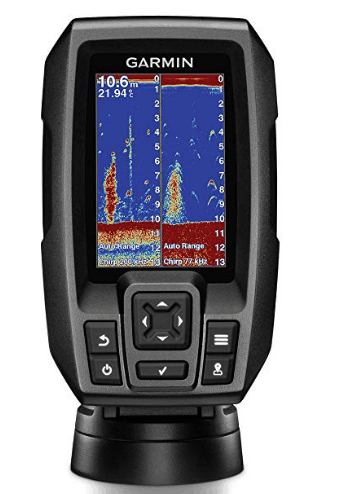 Garmin ditched the traditional transducers and adopted a latest 2D CHIRP sonar system for this Striker 4 fish finder that provides you with a higher visibility and greater clarity level, and can also generate crisper fish arches with a greater target separation for the highest success rate. 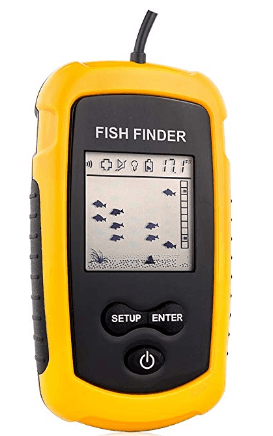 Moreover, this Striker 4 also has a built-in high-sensitivity GPS mapping technology that not only enables you to locate your current position quickly and accurately but at the same time helps mark the points where there are more fish so that you can have a more lucrative fishing spree. 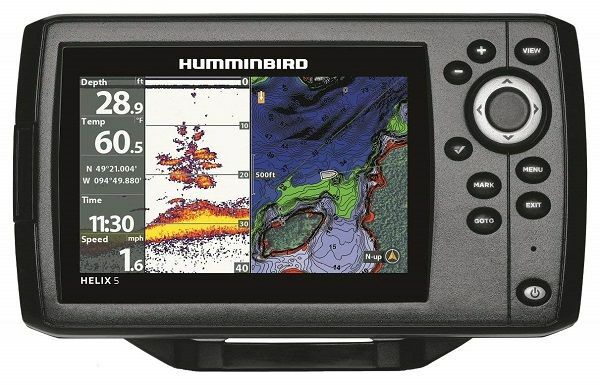 Humminbird has always been a reliable and a fan favorite brand as it offers an amazing price range and incredible performances. And the Buddy MAX Fish finder is no different; it is super simple and very easy to operate. 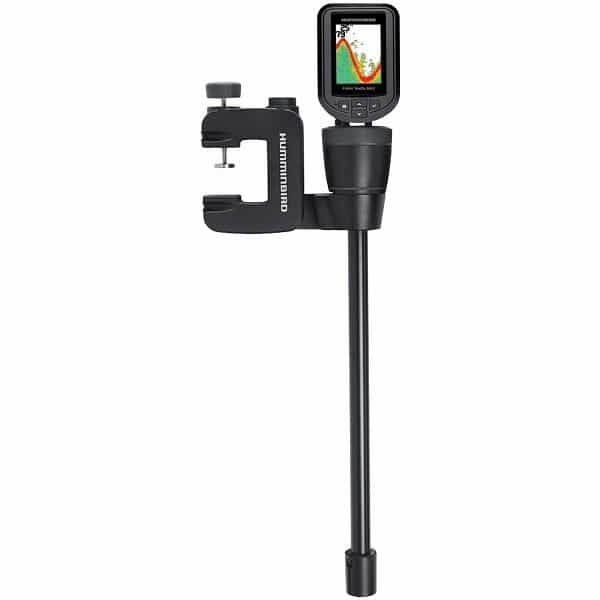 Even though this pint-sized, super portable finder lacks CHIRP technology, it still manages to provide you with a decent target separation and helps you to find fish targets effectively by using its Dual Beam sonar system. This Dual Beam sonar comes with two conical beams, each having a depth capacity of 600 feet to effectively keep track of the bottom. It is available in 2 different styles to choose from. Display backlit with 5 levels of brightness for added convenience. Additionally, this Buddy MAX Fish finder features 3 built-in alarm systems for battery, fish, and depth; each of these alarms goes off when the battery is low, when the finder spots fish of a specific size and when the depth is more than your preference to alert you in advance so that you can prepare yourself for any kinds of situations. The Striker Plus 5Cv is one of the newest fish finders from Garmin which is determined to make each and every of your fishing trips a memorable one. With its latest and improved sonar CHRIP technology, the dual frequency transducer not only provides more detailed and accurate underwater images but at the same time ensures better target separation which allows the fisherman to distinguish between individual fish more efficiently. Furthermore, this fish finder comes with a built-in, integrated GPS system that helps the fisherman to mark individual spots, waypoints and create routes for future convenience. Includes CHRIP technology for greater target separation and enables to create and save maps from 1’ contours to maximum 2m acres. 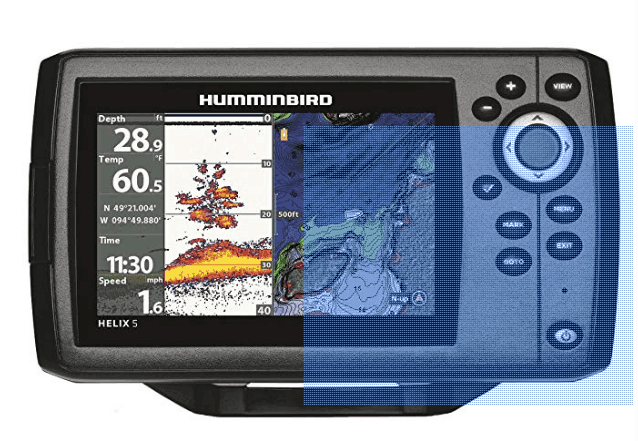 The latest and one of the most upgraded versions of the HELIX series, the HELIX 7 CHIRP GPS G2 Fish finder from Humminbird comes equipped with a 7 inch, 800 x 480 resolutions wide coloring display that provides super clear image and easy data reading. 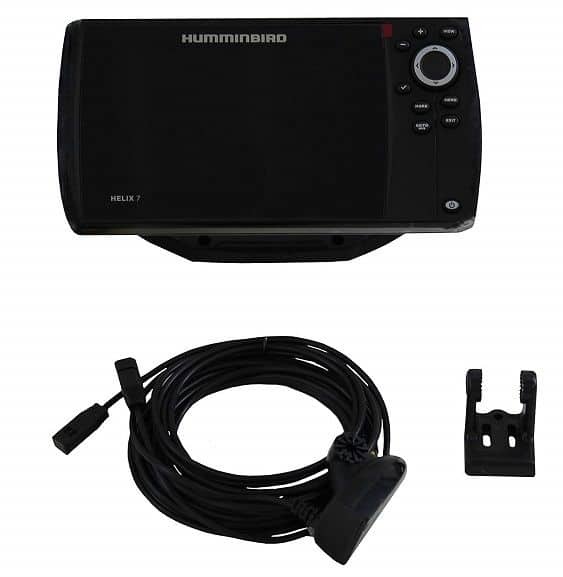 Besides, this HELIX 7 fish finder incorporates Precision GPS system with built-in Basemap feature especially made by Humminbird that helps you to map different water bodies and enhances your ability to view underwater terrain and surrounding points efficiently. Comes with Internal GPS for precise mapping and fish identifying. It has Bluetooth connectivity compatible with Android devices. This clear vision ensures that you have a very fruitful fishing spree regardless of the weather conditions. 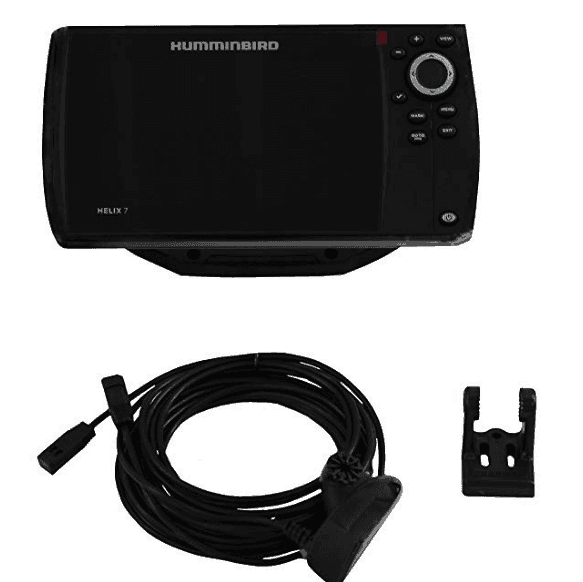 Additionally, Humminbird included a Micro SD card slot to this fish finder to record and save every data, sonar recordings, and images that are of importance to you and can be used in future, if needed. Make your next fishing trip a super successful one with just one little fishing gadget, the Venterior VT-FF001 Portable Fish Finder, which is extremely lightweight and incredibly efficient in identifying fish in river, sea, lake, and many other fishing environments. Furthermore, this Venterior VT is compatible with saltwater, freshwater and ice fishing styles; this is truly an all-rounder fishing gadget at a very attractive price range. This easy to use fish finder for dummies comes with a Single-beam transducer that is capable of spotting fish from a depth of 2.3ft to 328.08ft, but with this transducer, you won’t get data about underwater objects and structures. Single-beam transducer provides readings up to a 328.08ft depth. Super compact and lightweight; offers easy portability and storage. Once it spots fish bigger than 10cm, the fish alarm starts buzzing so that you can cast your pole immediately to achieve more success. 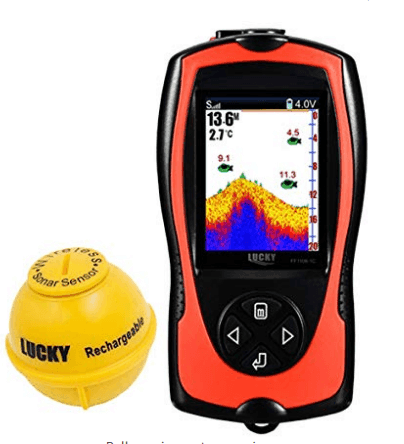 The Lucky Portable Fish Finder makes for an excellent choice for fishing enthusiasts who are looking for an all-around fish finder for a better fishing experience. It comes with a wireless range of up to 196 feet and can be used for ice fishing, river fishing, sea fishing and several other different types and styles of fishing. 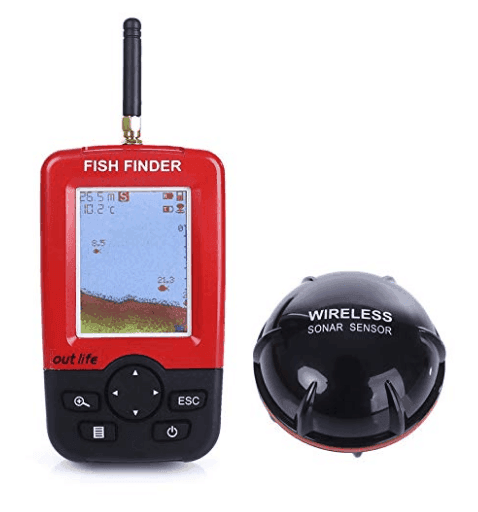 The varieties of fishing styles and features settings with an effective sonar system make this Lucky Fish Finder very popular amongst its user. The sonar sensor comes with fish attractive lamp and a fish alarm that can easily detect fish and alert you so that you have a fruitful fishing. Features various features settings for added convenience. In simple words, a fish finder is a sonar device that is used by fishermen and fishing enthusiasts to locate fish in the water. It does this by sending and receiving frequent sonar waves under the water to collect information about fish and other surrounding objects. This information is then displayed in the screen for the convenience of the anglers. Fish finders have become an integral part of modern day fishing as it guarantees success and is also very much easy to carry around. There are several factors that need to be considered before buying your ultimate fish finder. Below are a few of the most vital aspects that must be taken into account when buying a fish finder. 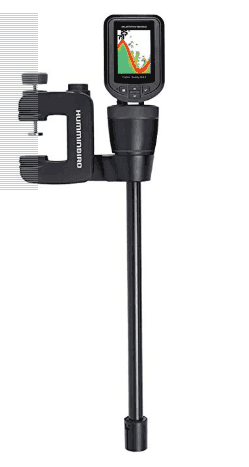 The transducer is the most important part of a fish finder as this component is responsible for detecting and locating fish of your preferred size. It does this by sending sonar waves that hit nearby fish and objects and returns back; this data is then translated into pictures and is shown in the LCD screen of the fish finder. Buy a fish finder with a transducer that has a quicker and faster sonar sensor system. Try to choose a fish finder that has a GPS system to it; GPS not only helps to calculate your exact position with the assistance of satellites but at the same time provides the opportunity to mark the hot spot for fishing for future trips. When choosing a fish finder, try to look for one with the right frequency range; frequency range is a very important feature of the transducer because it detects fish and other objects with the help of frequencies. There are usually 3 types of frequency available in the market: 50, 83, 192 and 200 kHz. The higher the frequency, the clearer the images on the LCD screen. Find a display that is big and consists of more pixels; because high resolution will enable you to see a clearer and more detailed image in comparison to others. However, high resolutions display will cost you more, so it’s better to find the best being in your budget. Furthermore, a colored display is far better than a black and white one, because it shows more detailed, clearer and bright images compared to a black/white one. It is also an important feature to consider when buying a fish finder as it determines effectiveness and better speed. This is represented by watts, and higher watts’ fish finder ensures superior performance, even in deep water. Reading a fish finder is quite simple; you either read it from right to left or from top to bottom depending on your preference. When you adopt a sonar or down imaging mode, you interpret the readings from right to left where the most recent information pops in the right side and pushes the old readings to the left. Even when your boat is at a halt, the display will still show readings, but in this case, you will only get readings of this specific one area. However, the side imaging mode which gives readings from top to bottom shows a little bit more as it uses higher frequency waves to collect information. The topmost image is the oldest while new image emerges at the bottom of the screen. Using a fish finder is fairly easy. After reading the instruction manual carefully and installing the fish finder properly, set up different adjustments like sensitivity level, fish id settings, water depth and few others before dropping the gadget in water. Also don’t forget to adjust the screen to receive clearer, uninterrupted images. Fish finder uses sonar signals to detect fish in the surrounding area. Every finder consists of a built-in transducer that frequently sends out sonar signals to collect underwater information. When the signal hits an object, it bounces back to the transducer with the information of the object’s estimated size, depth, and position. The transducer then sends this information as image form to the screen so that you can interpret what’s going underneath the water. The best way to improve your fishing game is to add a quality fish finder with your other fishing accessories; it not only helps to detect fish but at the same time can keep records of the fish crowding spot for future convenience. 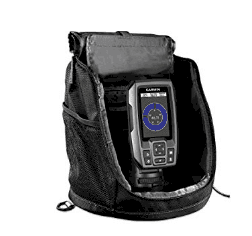 All the above portable fish finder reviews were conducted to help all the fishing enthusiasts out there to find the ultimate fish finder that will help them to enjoy a super successful fishing trip. All these finders were selected based upon their sonar wave strength, frequency, power, size, display, and price range. With an appropriate fish finding gadget, you will have more confidence and achieve more success in all of your upcoming fishing sprees.